As summer approaches, it's time to get out of town and explore this big, beautiful world. However, if you are stuck in the airport for any length of time, it can take a toll on your mind, body and spirit. Excessive sitting in tight spaces can weak havoc, resulting in tight muscles and depleted energy. 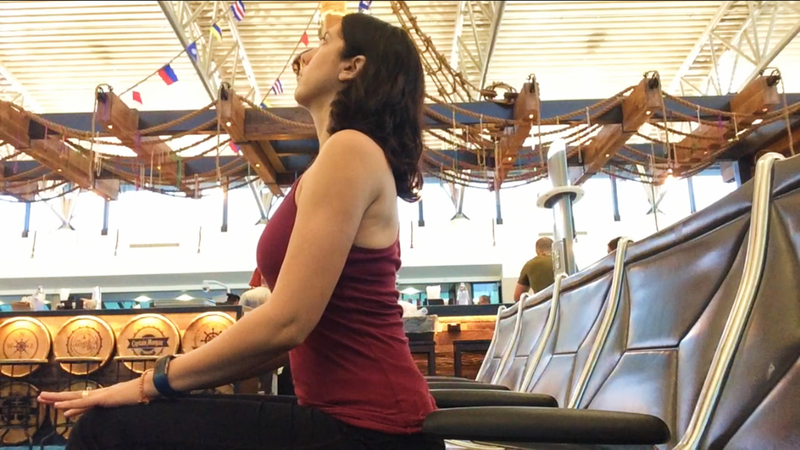 Below is a short sequence you can do while waiting in the airport to relieve tension and strengthen your resolve. Sukhasana translates as easy pose, and is traditionally done sitting on the floor with one leg crossed in front of the other. In this variation, start by sitting in a chair, placing your feet firmly on the floor. Scoot forward on the chair so your legs are at 90 degrees with knees in line with ankles. Place your hands onto your knees and draw your shoulders up, back and down, opening the front of the body and lifting up from the sternum. Close your eyes to the degree you are comfortable, and bring your attention inward. Take 5 to 10 breaths in and out through the nostrils, focusing on rooting down through the feet while lengthening the spine. Staying seated with your hands on your knees, exhale completely, allowing all the stale air to leave the body. As you inhale, lift the sternum and slide the shoulders down the back. Feel the abdomen and ribcage expand as you take a full breath in through the nostrils. Exhale and round the spine, drawing your navel in and up. Slightly rock back, and allow your head to fully release. Lift your heart as you inhale, feeling an expansion through the front side of the body. As you exhale, round your spine, using your hands on your knees to create traction and release the upper trapezius muscle. Flow back and forth 3 to 5 times between cat and cow, while focusing on inhaling and exhaling fully in each pose. Bring your right hand to your left knee, left hand behind you. Inhale, lengthen out of the low back. Exhale, twist your torso to the left. As you breathe, allow the twist to originate from the navel. Keep lifting the heart as you take the twist a little deeper. Roll your left shoulder up, back, and down, feeling an expansion through the pectoralis major muscle. Take 3 to 5 breaths before gently returning back to center. From here, place your left hand on your right knee, right hand behind you as a kickstand. Inhale to find length and exhale to twist to the right. Remembering the directions from above, take 3 to 5 breaths before returning back to center. Come to standing with your feet hip distance apart and parallel. Take a moment to feel the feet on the ground, spreading the toes wide and pressing down through all four corners. Soften your knees as the tailbone releases down. Feel a gentle lift in the sternum as you roll the shoulders down the back. Take 2 breaths here, feeling firmly grounded and centered. From here, interlace your fingers together. Inhale and and extend your arms overhead. Continue to root down through the feet as you lengthen the entire body. Exhale, lean to the right. Press down through the left foot, experiencing the stretch all throughout the left side body. Think about breathing evenly into both lungs, maintaining the length of the torso as you spiral the heart open. Inhale back to center. Exhale, lean to the left. Press down firmly through the right foot, lengthening the entire right side body. Notice the space between the intercostal muscles in the ribcage. Inhale back to center. Lengthen first as you inhale, extending the arms overhead. Exhale, bend the knees and fold from the hip crease, allowing the head, neck and shoulders to hang heavy and loose. Gently shake your head from side to side, releasing tightness and tension. Keep the knees bent deeply as you clasp opposite elbows and allow gravity to draw the upper body toward the earth. Breathe deeply for 3 to 5 breaths, as you surrender into relaxation. To release this pose, draw your navel into the spine and slowly rise up as you inhale, passing over each vertebra one at a time. Allow the head and neck to arrive last. Sit back down on a chair, scooting forward to maintain length in the spine and bring both feet to the ground. Place your right ankle on top of your left knee. Circle your right foot several times in either direction. From here, flex the right foot and bring your right palm to right knee, left palm to left ankle. Keep extending out from the low back as you inhale. As you exhale, begin to fold forward leading with your heart. Keep your right foot flexed as you breathe into any tightness felt in the right outer hip or glute. As you feel complete, return to seated, and bring your right foot back to the ground. Switching sides - place your left ankle on top of your right knee. Roll out your left foot. Flex the foot and begin to fold forward, noticing if this side feels different than the other. Take 3 to 5 breaths to release the hip, glute and hamstring. As you're ready, inhale back to center. With both feet on the floor, bring your hands to your knees and close your eyes. Bring your attention to the breath. Allow the breath to be smooth and steady as you naturally inhale and exhale through the nostrils. Keep the spine erect as you feel the abdomen rise and fall with each breath. If you notice your mind distracted by any internal or external disturbances, you can count the breath. As you inhale, silently say to yourself, "One...I am breathing in." As you exhale, silently say, "One...I am breathing out." Continue counting in this fashion until you begin to feel relaxed. Take at least 5 to 10 breaths to fully calm the nervous system. As you feel complete, gradually open your eyes. Namaste!